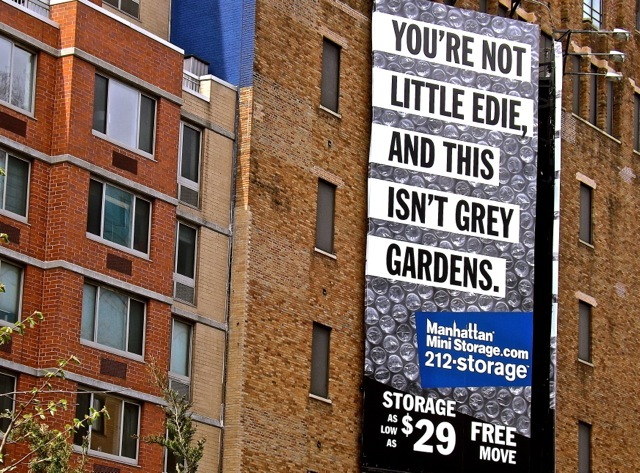 While walking along the High Line in New York City last month, I spotted this billboard for a storage company. 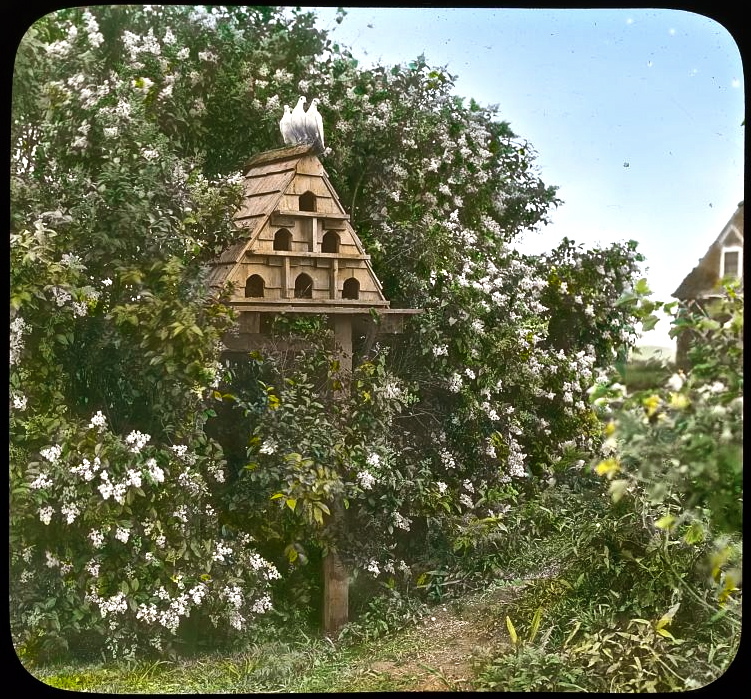 It made me remember these Library of Congress hand-colored lantern slides by Frances Benjamin Johnston and Mattie Edwards Hewitt. View from an upstairs window of the house. All photos via the Library of Congress Prints and Photographs Division. 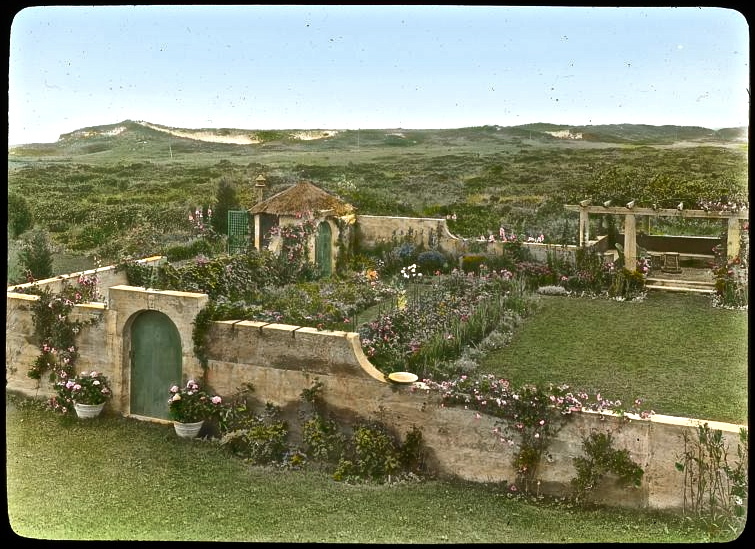 This was Grey Gardens in 1914 — long before it was made famous by the 1975 documentary. 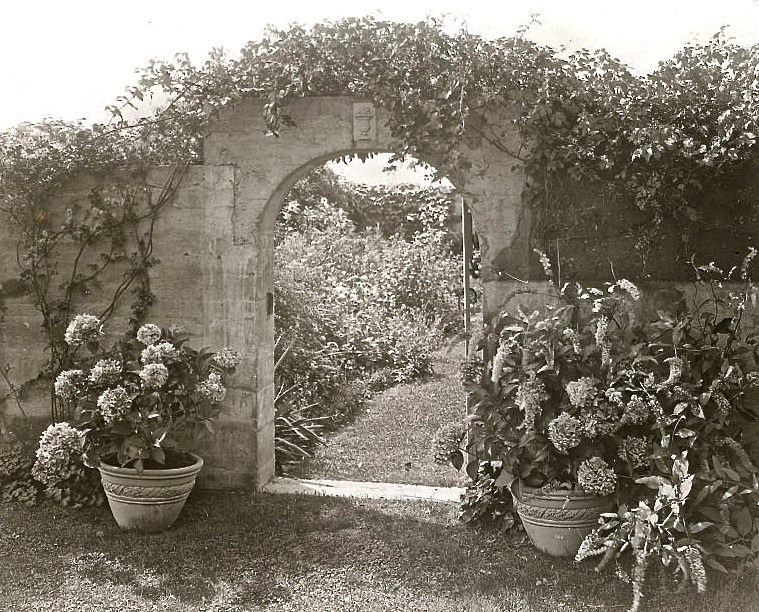 The walled garden section of the four-acre estate in East Hampton, N.Y., was designed by Anna Gilman Hill and landscape architect Ruth Bramley Dean. Anna and her husband, Robert Carmer Hill, had purchased the property in 1913. They sold it to Phelan and Edith Bouvier Beale (whose daughter was Little Edie) in 1927. 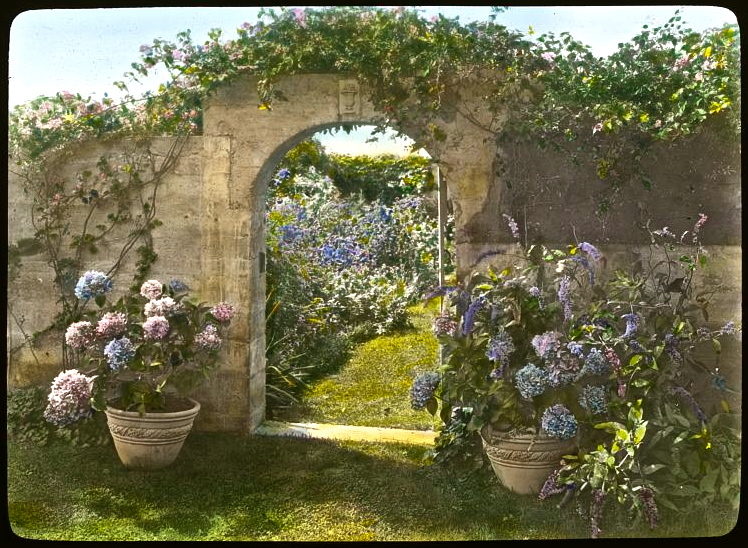 The northeast gate to the walled garden. Hill imported the concrete walls from Spain. She took the name for the house and garden from its environment. It was truly a gray [sic] garden. The soft gray of the dunes, cement walls and sea mists gave us our color scheme as well as our name… nepeta, stachys, and pinks… clipped bunches of santolina, lavender and rosemary made gray mounds here and there. Only flowers in pale colors were allowed inside the walls, yet the effect was far from insipid….I close my eyes and sense again the scent of those wild roses, the caress of the hot sun on our backs as we sauntered to and fro from our bath and lazy mornings on the beach. Beyond the property is the Atlantic Ocean. 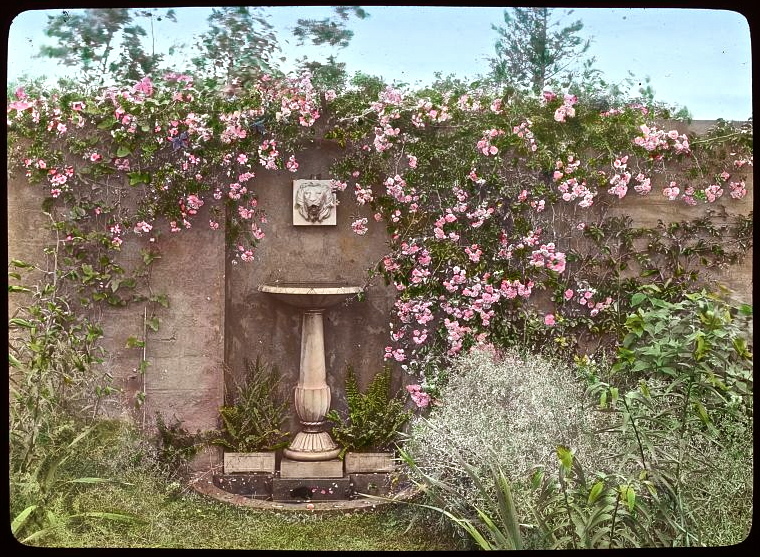 The walled garden was 70′ x 40′. 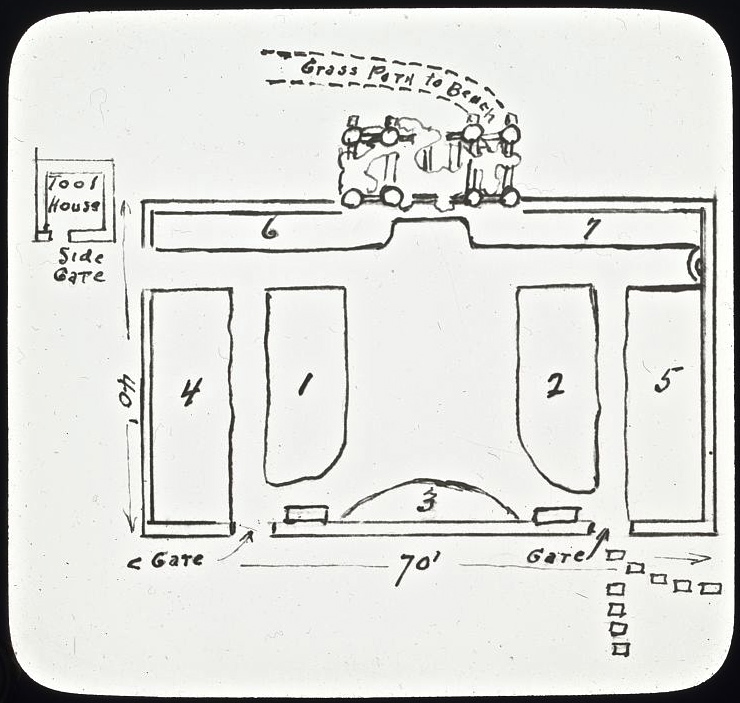 A plan of the garden, artist unknown. The estate (now two acres) has been owned by Ben Bradlee (formerly editor-in-chief of The Washington Post) and Sally Quinn since 1979. They have restored both the house and garden. 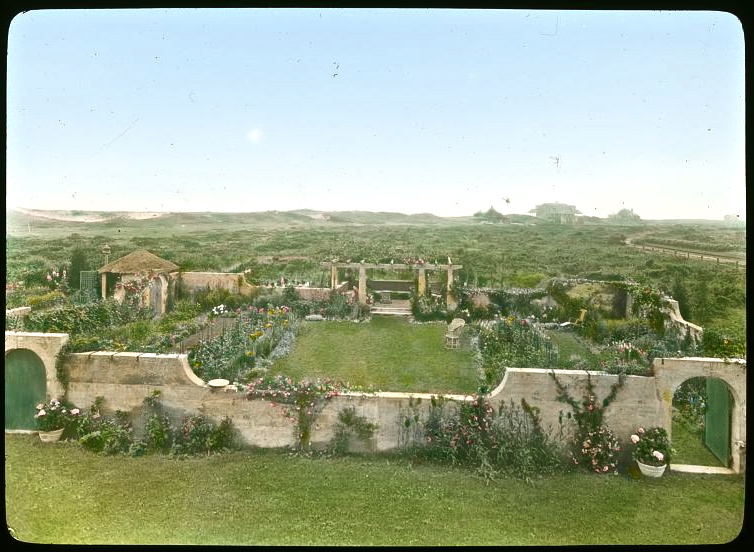 Now the land between the walled garden and the ocean is filled with newer houses and gardens, and there is a very tall hedge just behind the far wall and the pergola. The original photograph before hand coloring. The bench inside the northeast gate. Pergola and tool house gate. East gate to the tool house. 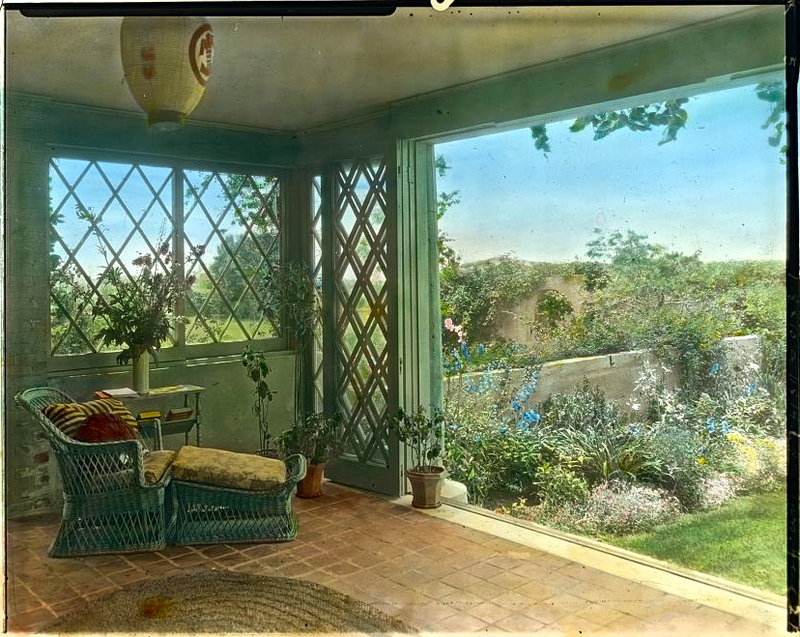 Sunroom in the house overlooking the walled garden. 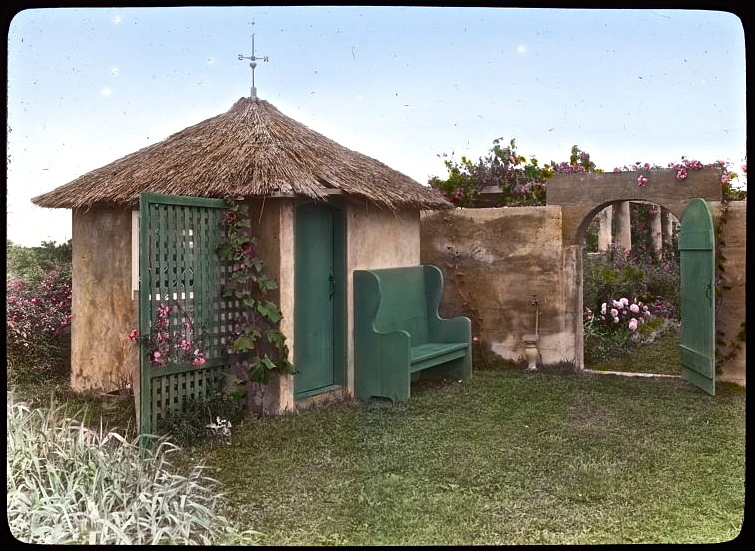 The open doorway in the photo above lined up with the pergola. 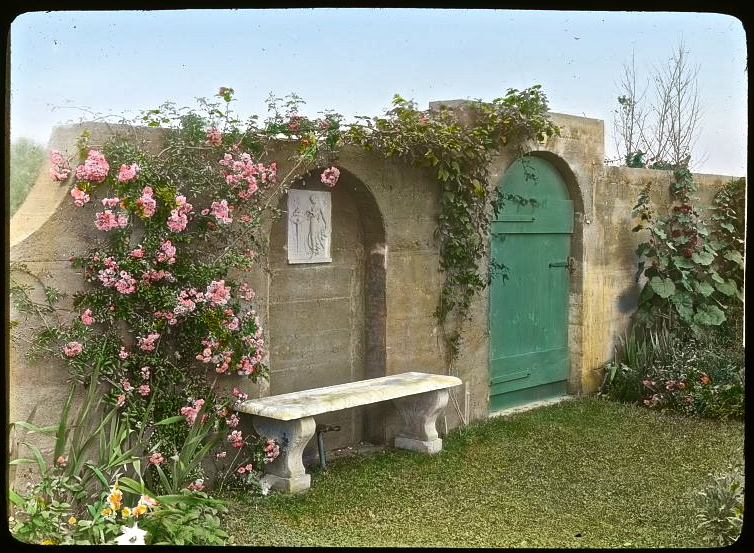 It seems that, at the time of this photo, there was an opening in the garden wall between the house and pergola. But I can’t tell if the opening was there before or after the time of the other photographs. Thanks. What a gorgeous setting it once was for a walled garden. Having grown up spending summers on that part of Long Island, I find it incongruous to have such a garden nestled among the sand dunes. I like to remember the sand dunes as wild, empty places – the formality of Grey Gardens clashes with the wild, windswept natural setting. 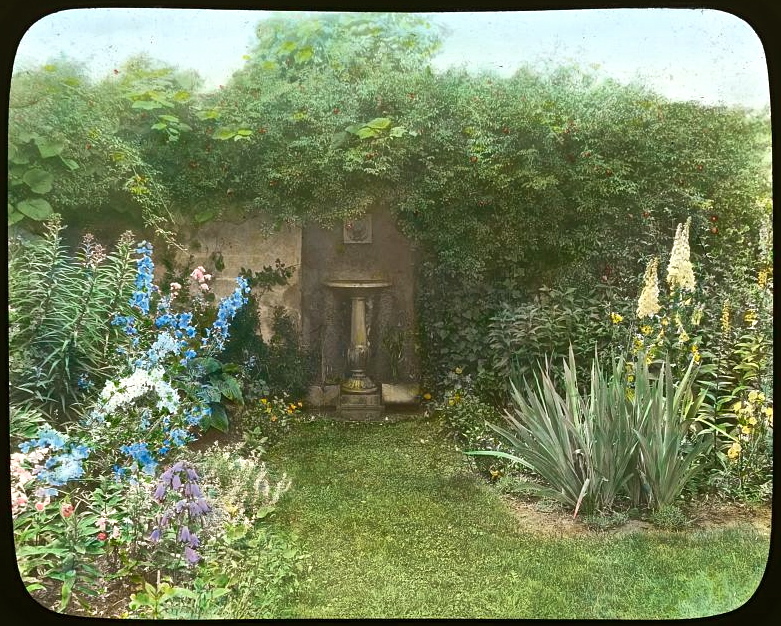 Nevertheless, the garden in the lantern slides is beautiful. 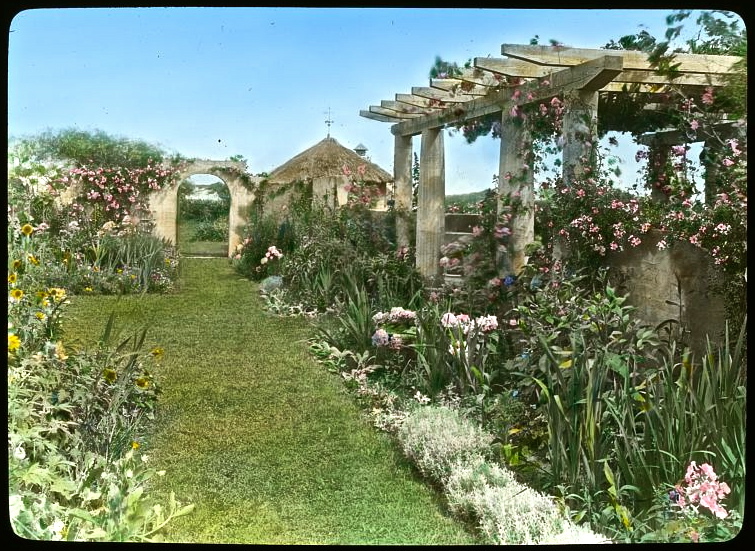 I have seen photos of the garden since Ben Bradley and Sally Quinn restored it, continues to be a beautiful garden. 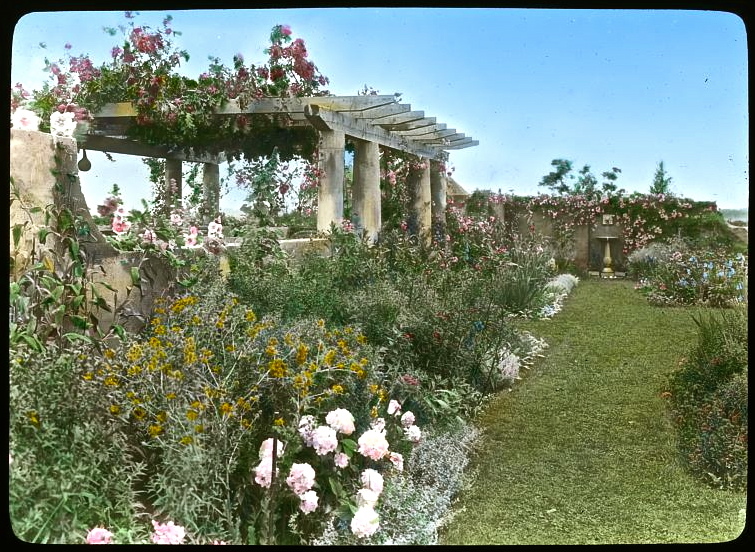 No doubt, all the elements of Grey Gardens – Anna Gilman Hill, Frances Benjamin Johnston, the Bouviers, East Hampton, the Maysles brothers 1975 documentary, Ben Bradley and Sally Quinn – contribute to its unique place in American garden history. The first two photos are somewhat deceptive, because the house is actually quite close by. But in the pictures, the presence of an (apparently) antique walled garden in the open (apparently), so close to the sea, is a bit mysterious. 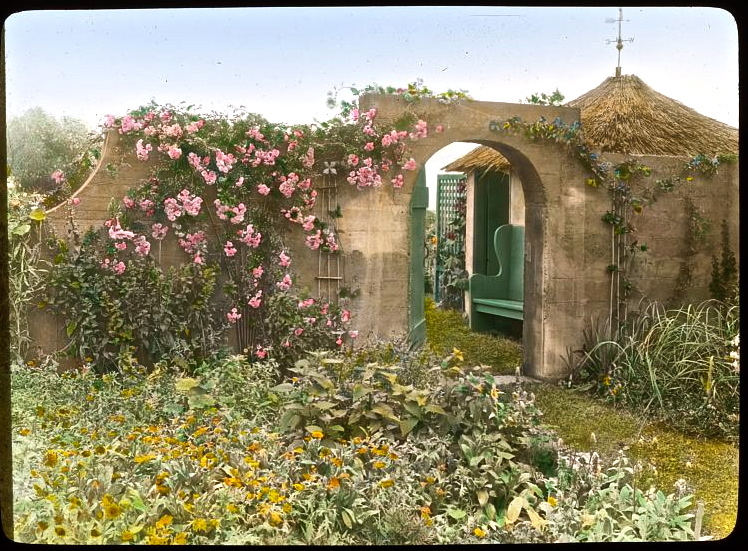 Today’s Grey Gardens is very lush, and the previously open space to the beach is filled with other houses and gardens. When the Bradleys bought the estate, they couldn’t see the walls at all and then later had to drop a bulldozer over them to remove all the vines and overgrown shrubs.